Since the change of guard in 2010 with the all-new reverse-cylinder engine of the Yamaha YZ450F, it has been tall, wide and ill-cornering. Over the last eight years the YZ450F has gotten slimmer, but not slim enough. It is a big bike. Short riders are on their tippy-toes, and the bike has a high center of gravity on the track. We have tested softer springs, stiffer springs and every suspension setting imaginable, as well as longer links. We like the Kayaba SSS suspension components. They are great, but they are only as good as the chassis they ride on. 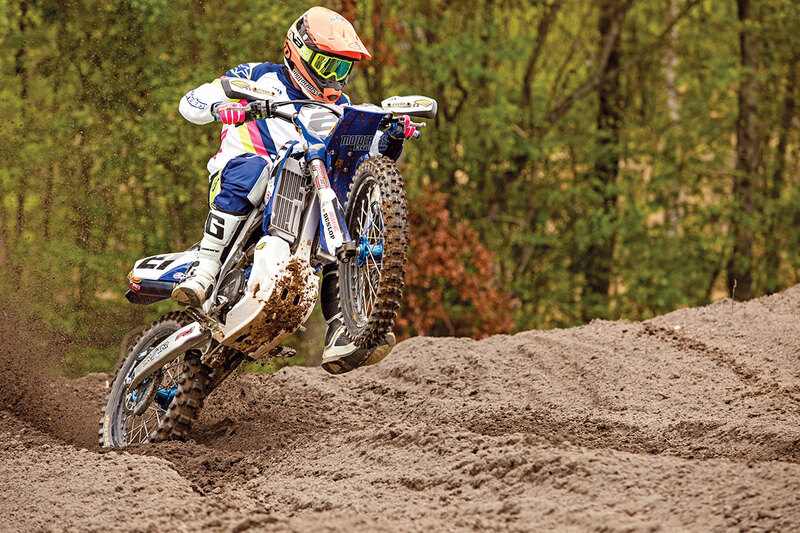 We were tired of fighting the cornering characteristics on the YZ450F. We just wanted to be able to make one smooth corner without any twitches, a vague front-end feel or over-steering. FTI Suspension is a company that we have used many times over the years. Every time we fly to North Carolina to test bikes, which is once or twice a year, FTI has something new for us to try. The owner of FTI Suspension, Cal Northrop, kept hearing his customers complaining about their all-new 2018 YZ450F and he wanted to help. He found that every rider 5-foot-9 or smaller had issues with the height and girth of the bike. This got him thinking that the center of gravity might be higher than it should be. By lowering the chassis, it would make shorter riders happy—plus they could touch the ground. And, it might fix some of the bike’s poor handling characteristics. Cal designed a 9mm damper-rod limiter, which is simply a billet spacer that slides over the damper rod prior to installation and into the damper tube to shorten the SSS fork by 9mm. He then machined off the stock spring-seat retainers to expose the snap ring and replaced it with adjustable retainers that FTI manufactures. This is something that is standard on A-Kit suspension. You could spend $5000 for A-Kit forks to get this option or spend $249 for FTI’s adjustable spring seat and lowering kit; your choice. This modification allowed FTI to set the proper preload, regardless of the lowering kit length or spring length, with minimal preload washers. If you don’t think 9mm is low enough, FTI’s adjustable retainers are able to set the proper preload—up to 37mm lower. That is over an inch and a half of lowering refinement on the forks. In the rear of the bike, they used a 0.110 limiter to lower the rear by 9mm like the front. A JGR adjustable-length shock link set at 143mm (standard is 142mm) dropped the rear 13mm in total. The longer link lowered the rear of the bike approximately 4mm with every 1mm added to the pull rod length. The JGR link ($279.99) has three adjustments—143mm, 144mm, and 145mm. With this system you’re able to move the front of the bike up or down by sliding the forks in the clamps and change the height in the rear with one nut and slug change. Cal kept everything else stock in the internals of the Kayaba components so MXA could get a fair comparison with stock trim, even the shoddy thick outside oil that was left in. EVERY TEST RIDER HAD MORE CONFIDENCE WITH THE YZ450F BEING LOWER TO THE GROUND. IT MADE THE YZ450F FEEL AGILE. What did we think? It was the first time that we felt the YZ450F corner with so little input in decades. It didn’t wallow or push, oversteer or understeer; it just felt normal. And the YZ450F has felt anything but normal since 2010. We were impressed. We actually ended up with the same settings we used when we tested with Yamaha in the “Living With the YZ450F” in the July issue. It worked like a charm with the lowering kit. Every test rider had more confidence with the YZ450F being lower to the ground. It made the YZ450F feel agile. All the shorter riders loved the change, although it obviously didn’t fix the bike’s wide feel. Fortunately, Cycra Racing is working on narrower side shrouds as we write this. What would we change? The thick-viscosity Yamaha fork oil, which FTI always changes to a lighter 5-weight oil. It was our fault for telling Cal we wanted everything stock, save for his lowering kit and SKF seals (for durability). When the forks got low in the stroke, the stiffness spiked. We feel Yamaha runs high-viscosity oil to lessen fork-seal leakage on the showroom floor. FTI can also upgrade your valving, but we must admit, if you are 170 to 190 pounds and Novice to Intermediate, the settings are fairly good in stock trim. Full service is $399, lowering kit $249. For more information, go to www.ftisuspension.com.